If you've been following my blog for a while, you know that I am addicted to anchor charts. I think it's the ESL teacher in me... I like the idea of having a visual reference available in the classroom for those kiddos who need it. 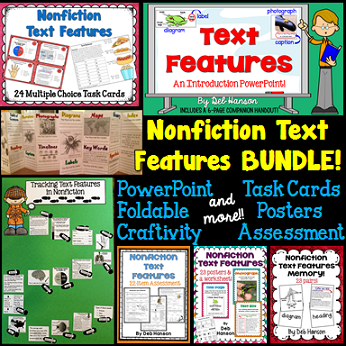 There are so many great nonfiction text feature anchor charts on Pinterest, and I've recreated several of them over the years for my own classroom use. The one I am going to share with you today, however, is a near-replica of one I created myself one year after realizing that many of my ELLs were confusing the index and the glossary. As you can see, this anchor chart compares and contrasts the four text features that are actually full pages in a nonfiction book. 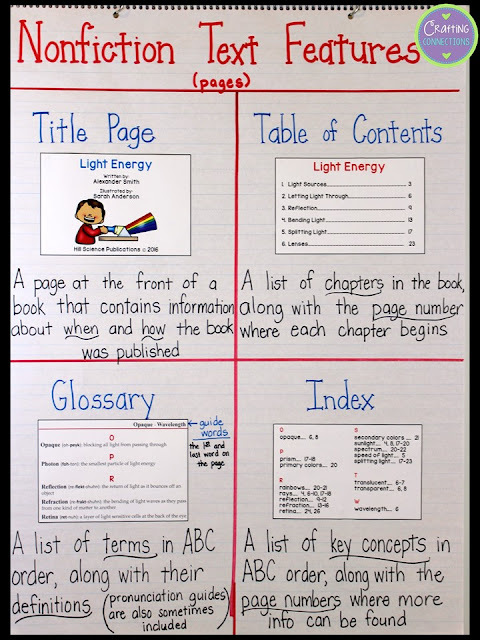 When using this anchor chart as part of a lesson, I recommend having everything except the definitions on the anchor chart when you begin class. When I begin the lesson, my students and I study one image at a time, and I ask students to share what they notice about that page (I jot their ideas on the board in the form of a bullet list). Yes, sometimes I have to "steer" the discussion in a certain direction to help them notice certain aspects of the text feature. After a brief discussion, I write a definition below the image. 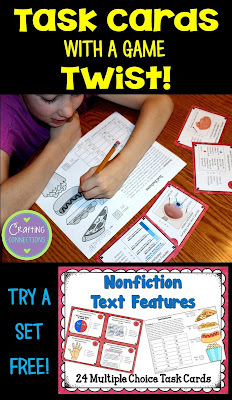 I would like to share one more tip with you about guiding readers to use nonfiction text features as they read. When I was younger, I remember struggling to know exactly when I should be looking at the various text features on a given page. Do you read the text before looking at the text features (like diagrams, text boxes, etc.) on the page? 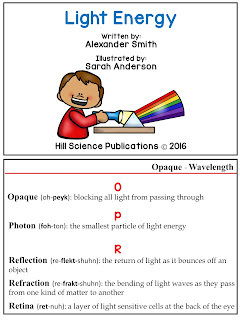 Do you scan the text features after reading the text? I must confess that I used to do the latter... read the entire chapter, and then go back and scan the text features. I did it as a way to check myself for understanding. Then, during a professional development experience near the beginning of my teaching career, a speaker recommended that we teachers direct students to preview text features as a prereading strategy! When I learned this, I had to restrain myself from slapping my forehead with the palm of my hand. That makes so much sense... why hadn't I thought of that before? In college, I had learned about doing a "picture walk" with beginning readers before beginning a fiction book. This is an easy and effective way to frontload vocabulary and have them make predictions. It makes perfect sense to do a "text feature walk" with readers at all levels before beginning a nonfiction book for those very same reasons! I have found that this strategy works so well... for myself and my students! I would love to hear your experiences with this strategy, or if you have another tip that works well with teaching students how to use nonfiction text features! 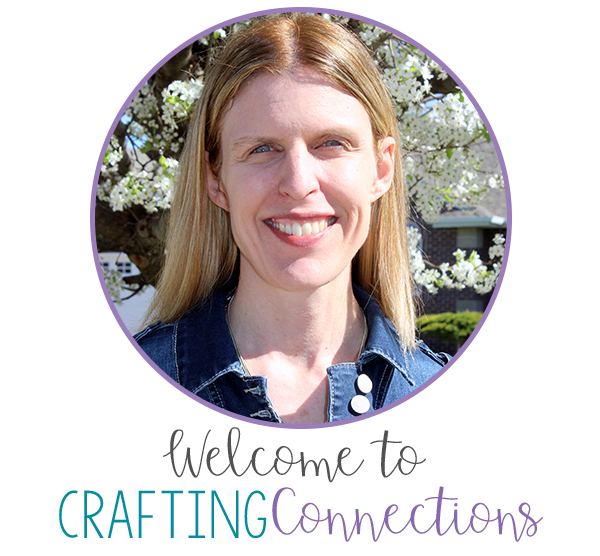 If you are looking for additional text feature resources, I have several available in my store! These task cards that contain a game twist are FREE. Click on this image to preview the my text features bundle, or to check out an of the individual items seen below.